Three more GOP candidates who took shots at the Senate leader lost their primary races Tuesday night. 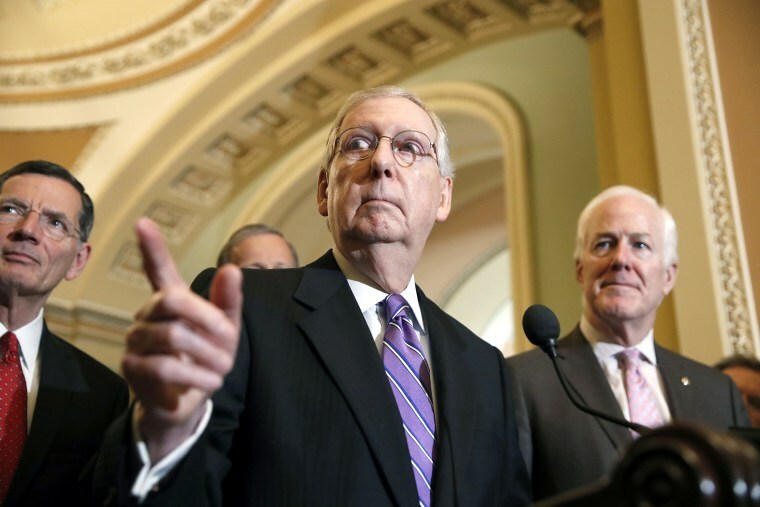 WASHINGTON — Attacking Mitch McConnell might succeed in getting some insurgent Republican candidates a lot of attention, but it hasn't yet proven to be a strategy that actually wins elections. As Senate Majority Leader, McConnell has become the figurehead of a Washington political establishment that his own party's rank-and-file loves to hate. But those who pursue a scorched-earth attack on him continue to lose the battles against McConnell and his allies in Republican primaries. This week brought more examples, as three Republican candidates who ran campaigns that leveled pointed attacks at him lost their primary races Tuesday. The most high-profile example was in West Virginia, where GOP Senate candidate Don Blankenship placed third in the Republican primary after aggressively blasting McConnell, calling him “Cocaine Mitch" and taking aim at his wife's heritage with a racially-charged reference to "China people." Blankenship's campaign spent an estimated $2.7 million on TV ads during the primary campaign, with at least a portion of that going to spots directly attacking McConnell. In return, a Northern Virginia-based super PAC, Mountain Families PAC, whose donors are unknown but is thought to have ties to McConnell and Senate Republicans, spent about $1.3 million in ads attacking Blankenship. McConnell, who rarely conducts interviews, took what sounded like a victory lap Wednesday following Blankenship’s decisive loss. “I am glad the people of West Virginia decided that particular approach of attacking me and my family was good for a distant 3rd place.” McConnell told Fox News on Wednesday. He added: "We have intervened in primaries where we have needed to in order to guarantee that we had fully electable candidates on the ballot in November." And in a Tuesday night tweet, his political team had some fun with a retouched photo from the Netflix series "Narcos," and a "thanks for playing, Don" message. Blankenship isn't the only anti-McConnell Republican that has failed to win in recent campaigns. Indiana Senate candidate Luke Messer, who criticized McConnell for not delivering for the party, came in third in his primary Tuesday. And Ohio Senate candidate Mike Gibbons, who blamed the failure to repeal the Affordable Care Act on McConnell, also lost. "The results last night were a good reminder that a campaign against Mitch McConnell earns candidates a first-class ticket to last place." said John Ashbrook, former top aide to McConnell, told NBC News. The blame-McConnell strategy was one Alabama Senate candidate Roy Moore pursued during the special election last year where he prevailed in the primary despite the McConnell-aligned super PAC, Senate Leadership Fund, spending nearly $5 million against Moore. But Moore lost in the general to Democrat Doug Jones after multiple allegations of improper sexual behavior with teenaged girls engulfed his candidacy. Despite the poor track record, primary season is not over and some candidates are continuing the anti-McConnell attacks. Just as Blankenship was conceding defeat, another Republican Senate candidate — 2,000 miles away in Arizona — picked up on the anti-McConnell theme. McConnell and his political allies are not backing Ward in the primary race there, instead putting their resources and support behind Rep. Martha McSally, giving Ward more reason to attack the leader. Sen. Jeff Flake, R-Ariz., who is vacating the seat that Ward and McSally are gunning for, said Congress also has an especially low approval rating, making it a natural enemy for candidates. Anti-McConnell sentiment is not new to 2018. It was used in the past three election cycles as well by Republican candidates, including Todd Akin in Missouri and Indiana’s Richard Murdoch in 2012. While both candidates won their primaries, they lost in the general election. Chris Pack, spokesperson for the Senate Leadership Fund, said McDaniel’s attacks on McConnell aren’t working, pointing to dismal fundraising numbers in the first quarter of this year. He raised just $154,000. "The anti-McConnell playbook just doesn’t play back home," Pack said. While Congress has low approval ratings, McConnell’s are especially low. He is the most unpopular Republican politician, polling at just 13 percent favorability according to a January NBC News poll. Running against the leader of the party is a strategy that Democratic candidates have used for the past several election cycles as well, with many distancing themselves from House Democratic Leader Nancy Pelosi in elections. Sen. Cory Gardner, R-Colo., and head of the National Republican Senatorial Committee, the organization that works to elect Republicans to the Senate, said the McConnell attacks are nothing more than an anti-Washington sentiment. Vaughn Hillyard and Carrie Dann contributed.